Dwarka is mentioned in the Mahabharata, the Harivansha, the Bhagavata Purana, the Skanda Purana, and the Vishnu Purana. 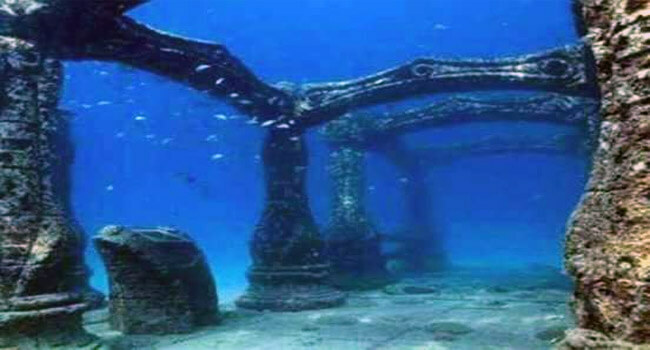 It is said that this Dwarka was located near the site of the current city of Dwarka, but was eventually deserted and submerged into the sea. Rumored to be over 30,000 years old, it may hold the keys to discovering whether these legendary tales were myth or factual accounts. According to the ancient Sanskrit texts, Salwa attacked the city in what can be understood as a spacecraft, raining down energy weapons that resemble lightning. He destroyed large parts of the city in this way. When this happened, the king of the city, the god Krishna, responded by firing weapons at this spacecraft. So, there’s a spacecraft made of metal that is firing down weapons on a city on Earth. Why did the indian government abruptly forced the original Dwarka excavation team to halt all exploration of its ruins on the arabian sea bed? Why any new exploration is now forbidden? Did India’s ancestors witness a war between extraterrestrial entities? If the mythical city cited in the Hindu texts turned out to be real, could there also be evidence that will forever change the world?